Is Your Doctor Laughing at You Behind Your Back? You’re sick, in the hospital, or maybe even undergoing surgery. The last thing you want to contemplate is the thought that your doctor might be making fun of your tattoos while you're anesthetized. But does it happen? Yes. According to a survey of doctors starting a residency in internal medicine, 17% had—along with their colleagues—made fun of a patient, sometimes when the patient was under. Egad. Is nothing sacred? The good news, though, is that 94% of the 110 medical interns who took the anonymous survey realized that such behavior was inappropriate, according to a research letter published in the Journal of the American Medical Association. That means that only seven doctors in the survey thought that type of behavior was A-OK. I guess it’s not that surprising, given the behavior of our on-air favorites. From Grey’s Anatomy to House, the overwhelming warts-and-all portrait seems to be this: Doctors are human. They fall in love, they get angry, and they like a good chuckle—sometimes at the patient's expense. Is it so surprising that some of those bad on-air behaviors might occur in real life too? Is unprofessional behavior more common than in the past? Television shows from yesteryear, such as Marcus Welby, M.D., and Dr. Kildare, presented doctors as somber and ultraprofessional, but that doesn’t mean that unprofessional behavior is a new problem, says study author Vineet Arora, MD, an assistant dean at the Pritzker School of Medicine at the University of Chicago. Learning respect and discretion are part of the so-called hidden curriculum—all of the things doctors learn on-the-job that don’t have to do with diagnosing and treating diseases. Hospitals want to make sure that more seasoned doctors don’t promote or perpetuate unprofessional behavior and that newly minted MDs—like those surveyed—learn what is appropriate and inappropriate by the time they finish their residency, the training period after medical school. While the teaching hospitals aren’t trying to drain all the humor out of the residency experience, they want to teach doctors where to draw the line. “I do think there are examples of really good-natured humor that is therapeutic, but not at someone’s expense,” she says. 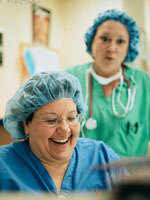 And laughter at a patient’s expense could compromise care, says Dr. Arora. Dr. Arora couldn’t say whether the behavior of TV doctors—such as Dr. House—influences real-life doctors in any way. “That’s an interesting question,” she says. But TV programs do influence the public’s image of doctors. “Certainly media portrayal of physicians definitely has an impact on the public perception of physicians,” she says. Dr. Arora suspects that sleep deprivation and burnout are part of the problem. Doctors who behave unprofessionally, she explains, might have troubles of their own. “There’s a lot of good data to suggest that people who are sleep-deprived in these settings do have more staff conflicts and burnouts and could possibly even further exacerbate unprofessional behavior,” she says. And there are more serious behavioral problems—aside from laughing at patients. The survey included questions about behavior that is frowned upon, such as attending a pharmaceutical-sponsored dinner or social event (69%), as well as behaviors that are considered egregious, including falsifying patient records (13%), and reporting patient test results as “normal” when unsure of the true results (10%). “Those are examples that would compromise patient safety,” Dr. Arora says. An unprofessional demeanor in residency could spell trouble for your entire career, she adds. Research has shown that those with poor ratings on professional behavior early in their careers are at greater risk of disciplinary action later on.